In 2014, Doula UK will be applying to the Charity Commission to become a registered charity. Doula UK is looking for new directors to join the Board of Doula UK now, and be a part of the exciting transition as Doula UK becomes a registered charity, remaining on the Board as Trustees of the charity. The ideal Board of Trustees will be made up of people with a range of skills and particular interests. These will ideally include working doulas, people who have benefited personally from the support of a doula and people with backgrounds in business, law, finance and fundraising. Most important is a belief in the importance of the work Doula UK does. 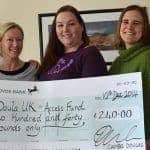 If you are passionate about supporting and promoting the work of doulas in the UK, and feel you may have something to offer, please do come forward. If you know someone who could be good and might be interested, please do suggest it to them. For more information, see here or contact the Doula UK External Comms team on pr [at] doula [dot] org [dot] uk (Subject: Trustees) .